Inside this cold and impeccably clean box are four warm eggs which float in a circle. 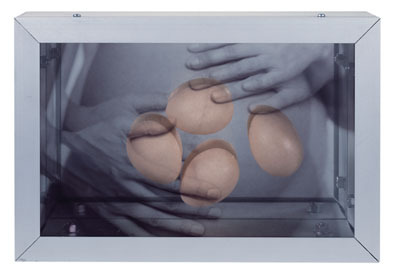 The eggs float behind a transparent image whose smell is barely perceived, like a soft fresh breeze. The image is a photograph of a pregnant belly with hands that hold it above and below. In the piece Gestation the four eggs make reference to the life that is being created, to the factory of humanity, and for me this smell of clean warm creation awakens a feeling of hope and protection.